It is, quite literally, a new ballgame. 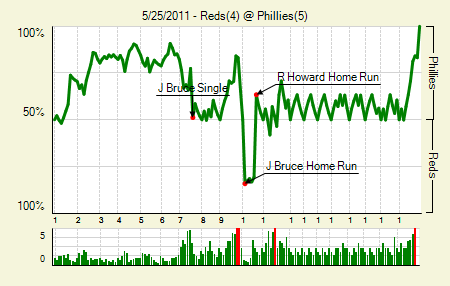 Moving the Needle: Ryan Howard matches Jay Bruce with an extra innings homer, +.440. 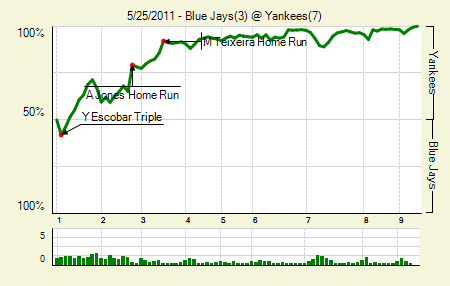 It’s kind of disappointing to have a game go to 19 innings, and the walk-off hit doesn’t even top the WPA chart. Of course, it’s the same story we see in many other walk-off situations: the Phillies had loaded the bases with one out, and a sac fly won it. Their biggest boost came in the bottom of the 10th, when, trailing 4-3 thanks to a Bruce homer in the top of the inning, Howard blasted one out to center. Little did they know that they’d essentially play another full game after that. Jay Bruce: 3 for 8, 1 HR, 3 RBI. The surge continues. Ben Francisco: 1 for 4, 1 HR. His first-inning two-run homer made it feel as though Philly would run away with this one, especially with Halladay on the mound. Moving the Needle: J.R. Towles singles home the winning run, +.400 WPA. 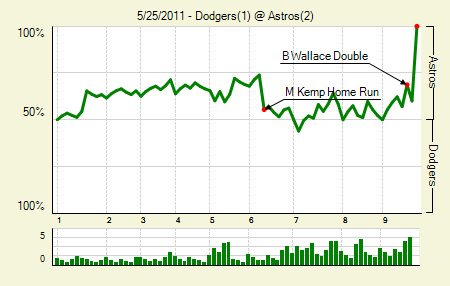 The Astros took an early lead on a solo homer, but the Dodgers tied it the same way in the sixth. Into the bottom of the ninth they went, tied at one. Brett Wallace set up the Astros with a one-out double, and two batters later Towles singled home the pinch runner to end the game. He had three hits in the game, which is quite a relief. He hadn’t struck a hit since May 4th, an 0 for 32 slide. Matt Kemp: 3 for 4, 1 2B, 1 HR. That’s five homers in his last nine games, and his second of the Houston series. Aneury Rodriguez: 6 IP, 4 H, 1 R, 1 BB, 5 K, 1 HR. This is the first time he’s completed six innings, though it’s been only five starts. This is also his highest strikeout total — and as many has his previous two games combined. Michael Bourn: 1 for 4, 1 HR. That was his first of the season, which must have come within 10 minutes of this post. Moving the Needle: Mike Morse ties the game with a three-run homer, +.165 WPA. Of course, the only runs that Zack Greinke surrenders come on one swing, and because it’s a game-tying three-run shot it’s the top WPA play. 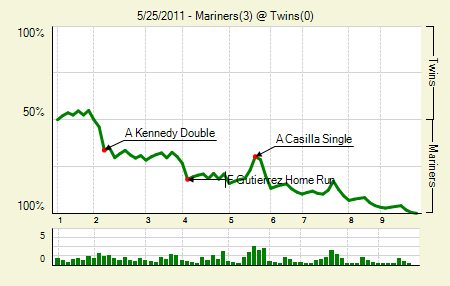 It’s unfortunate because Greinke’s own homer was pretty much the highlight in this one- and his marvelous pitching. Not to take away from Morse, of course, whose line shot over the left-center field wall was impressive on its own. Zack Greinke: 7 IP, 5 H, 3 R, 1 BB, 10 K, 1 HR. That 1 HR could, of course, be Morse’s or his own. Given his peripherals, it feels as though Greinke is going to hit some insane shutout streak in the near future. Prince Fielder: 2 for 2, 1 2B, 1 BB. 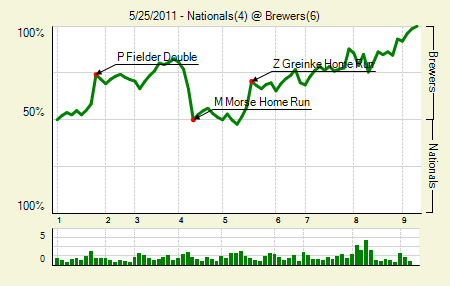 He drove in four of the Brewers runs, which pretty much finishes telling the story of this one. Moving the Needle: Adam Kennedy doubles home the first run, +.124 WPA. The Mariners didn’t get too many chances with runners in scoring position, but when they did they mostly took advantage. Their first run, though, came with only a runner on first. Adam Kennedy grounded one down the first base line and into right, which gave Franklin Gutierrez enough time to round the bases. The hit put Kennedy into scoring position, and he scored on a single later in the inning. Seattle had just one more opportunity with a runner in scoring position, but couldn’t come through there. Still, 1 for 2 works if your guy is throwing a shutout. Erik Bedard: 6 IP, 6 H, 0 R, 1 BB, 4 K, 14 GB. You’d like to see him get through six with fewer than 96 pitches, but it’s hard to complain about this one. Franklin Gutierrez: 2 fo 3, 1 HR, 1 BB. That is his first homer, and first walk, since returning from the DL. Moving the Needle: Andruw Jones raps his first first homer, +.142 WPA. The home run made a comeback in the Bronx yesterday, as the Yankees smacked three of them in their 7-3 win. Jones supplied two of them, both two-run shots. His first came in the second inning, a drive into the opponent’s bullpen, putting the Yankees up 3-0. In the sixth he put one out to dead center to give the Yanks a 7-1 lead. Those last runs, while not totally necessary, sure made things a bit more comfortable. Then again, when you have Mariano Rivera, who made his 1,000th career appearance, things are usually comfortable, even with a one-run lead. Curtis Granderson: 2 for 4, 2 2B, 1 HBP. His torrid streak continues. In three games he’s improved his OBP to .353 from .328 in just three games. Moving the Needle: Brooks Conrad breaks the tie with a two-run shot in the 11th, +.416 WPA. For a second it appeared the Pirates would win. They had runners on first and second with none out in the bottom of the ninth, and with a sacrifice and intentional walk they had bases loaded and one out. But Steve Pearce grounded into a double play, diminishing the good will he earned when he homered earlier in the game. 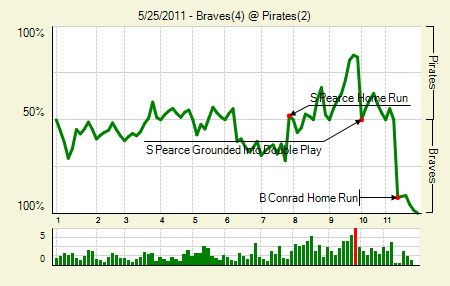 That sent the game to extras, and against Jeff Karstens the Braves got something going. With a runner on first and one out Conrad blasted a low pitch out to right, giving the Braves exactly what they needed. James McDonald: 6 IP, 6 H, 2 R, 1 BB, 6 K, 1 HR. He appears to be in good shape, as he’s allowed two or fewer runs in five of his last six starts. If he can start going deeper into games, he’ll be a legit threat for the Pirates. Moving the Needle: A.J. Pierzynski flies out to end the game, -.167 WPA. No, the WPA needle did not move much on offense. 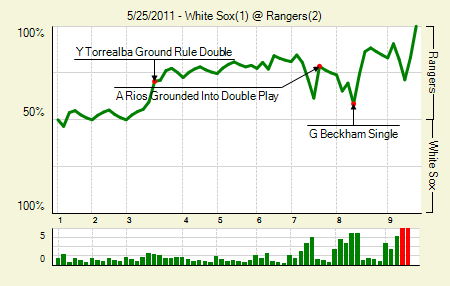 The Rangers got their first run, which will usually provide a 10% or greater boost, on a sac fly. That also dampened the second run, which they scored one batter later. The Sox never tied it up, so they didn’t swing the needle much, either. In the ninth, though, they got their win expectancy as high as 28.6% when they had runners on first and second with one out. They even put the tying run into scoring position, but Pierzynski could not bring him home. C.J. Wilson: 6.1 IP, 5 H, 1 R, 0 BB, 5 K, 8 GB. The White Sox did not play lawyerball against him, apparently. Gavin Floyd: 7 IP, 3 H, 2 R, 1 BB, 5 K. With an offense, this might have worked. Moving the Needle: Chase Headley puts the Pads on top in the eighth, +.338 WPA. It was a battle of two aces who had been struggling to varying degrees, but it lived up to the billing. 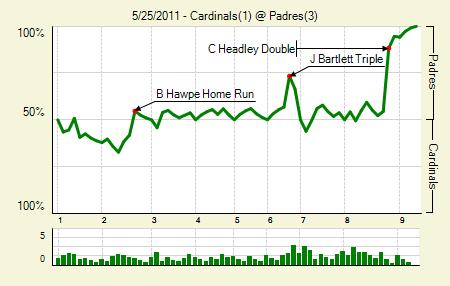 Tied 1-1 in the eighth, the Padres got something going when Jason Bartlett bunted for a single with two outs. Headley then bounced one down the third base line and into left, and Bartlett booked it around the bases. The throw was close, but Bartlett was there in time to break it up. That allowed Headley to take third; he scored on an infield single a batter later. Mat Latos: 8 IP, 6 H, 1 R, 0 BB, 7 K. That’s more like it. It is easily his best start of the year. Chris Carpenter: 8 IP, 8 H, 3 R, 0 BB, 6 K. So many what ifs. What if the throw is a split second earlier and Molina tags out Bartlett? What if Descalso doesn’t fumble with the infield single to third? It could have looked a lot better for Carp, which is saying something considering how well he pitched. 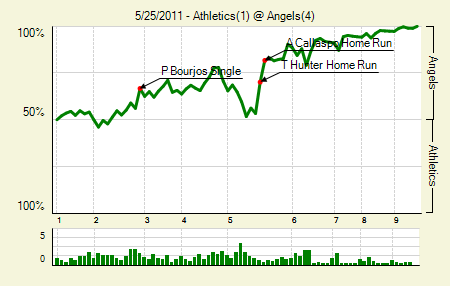 Moving the Needle: Torii Hunter homers to give the Angels a lead +.168 WPA. A pair of solo homers in the fifth made the difference for the Angels in this one. With the game tied at one Hunter lifted one over the fence in left-center to give his team the lead. One batter later Alberto Callaspo pulled one over the right-center field wall to extend the lead. The Angels would cap the scoring later in the inning. Ervin Santana: 6 IP, 6 H, 1 R, 2 B, 6 K. As you can see, he was good through six. Unfortunately, he had thrown 117 pitches and had to hand the ball to the bullpen. But that worked out well enough. Reggie Willits: 1 for 3, 1 2B. That was his first hit of the season, in 19 PA.
Moving the Needle: Carlos Beltran ties it at four in the second with a double, +.176 WPA. This one was, by all accounts I read, not so much fun. There were many walks and plenty of sloppy play. The big inning was the second. The Cubs had scored four in the bottom of the first, but the Mets came back to load the bases with one out. A single cut the deficit to two, and then Beltran brought home the tying runs with a double over Reed Johnson’s head in center. A walk re-loaded the bases, and then two more walks gave the Mets a lead. They’d pick up another later, before the game got called. Odd, that it says Final/7, but the Cubs never got to bat in the seventh. I thought they had to revert to the last full inning, in which case it would be Final/6. Really, there weren’t many notables here. 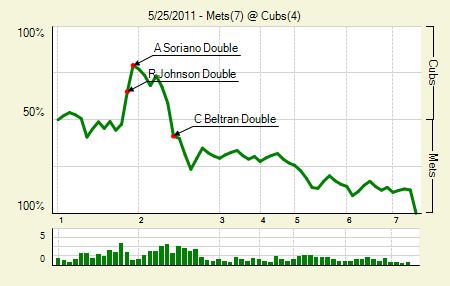 Lots of singles, though Johnson and Alfonso Soriano doubled. Beltran was the real highlight, with a double and a triple. Moving the Needle: Luke Scott doubles home a run, +.126 WPA. It was a full-out assault in the fourth, and Luke Hochevar stayed in for all eight runs of it. Scott’s double provided the second run, which was the first that wasn’t scored on an out. It went down the right field line and put runners on second and third, which came in handy when Hochevar missed and allowed the third run to score on a wild pitch. 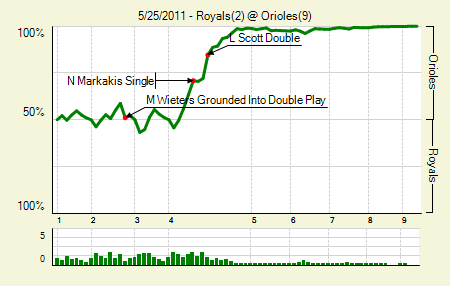 Walks and singles, plus an error, ruled the rest of the inning, and by the time Matt Wieters grounded out to end it the score was 8-0. Hochevar, of course, came out to pitch three perfect innings after that. Adam Jones: 2 for 4, 1 2B. He’s hitting more like 2009 than 2010, which is doubly good on account of the lower run environment. Jake Arrieta: 6 IP, 5 H, 2 R, 3 BB, 7 K. It wasn’t too too impressive, but he did miss some bats and mostly hold the Royals in check. 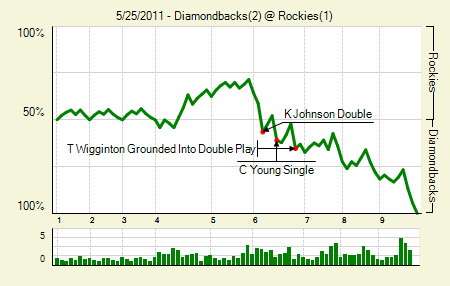 Moving the Needle: Kelly Johnson sets up the comeback in the sixth, +.153 WPA. It’s always a little odd to describe a non-run-scoring play that sits atop the WPA list. Thankfully, it doesn’t happen often. Here, it’s because Johnson’s double to right put runners on second and third with none out. That set up an RBI groundout, and then, later, and RBI single to give the Diamondbacks the lead. Ian Kennedy: 8 IP, 7 H, 1 R, 2 BB, 3 K, 13 GB. The Diamondbacks might be missing Max Scherzer, but not too too much. Jason Hammel: 7 IP, 5 H, 2 R, 2 BB, 5 K. This is another reason I dislike the idea of earned and unearned runs. The first runner in the sixth reached on an error, but everything else was clean. Yet Hammel was somehow charged with no earned runs. 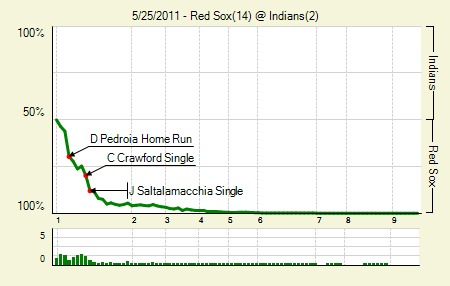 Moving the Needle: Dustin Pedroia homers, +.136 WPA. Well, that was quick. Jacoby Ellsbury singled to open the game, and then Pedroia launched one over the wall in left. The Red Sox would go on to score five more in the inning, and Pedroia added another RBI for good measure. It was not quite the return Mitch Talbot had envisioned. The rest of the game was just the Red Sox getting in some BP. Carl Crawford: 4 for 4, 2 2B, 1 HR. That’ll help boost the numbers pretty quick. He still has a long way to go, but a few more games like this will catch him up pretty quickly. Jarrod Saltalamacchia: 2 for 4, 1 HR, 1 BB. While he hasn’t hit or walked much this year, he has certainly brought the power. That was his 10th extra base hit of 24 overall hits. Moving the Needle: Aubrey Huff’s two-RBI single ties the game in the ninth, +.426 WPA. This game was actually a 3-2 affair heading into the ninth. 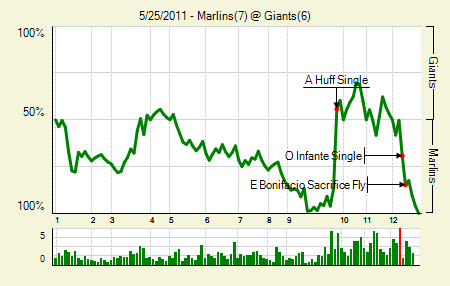 The Marlins then tacked on a pair to get some cushion, but the Giants came charging back in the bottom half. A passed ball helped, sure, but they definitely hit their way to the tie game. Huff came up with two outs and runners on second and third, and he dunked one into left to tie it up. They’d battle for a few more innings, until the Marlins scratched one across on a sac fly in the 12th. Freddy Sanchez: 4 for 6, 1 2B. He scored the tying run in the ninth after doubling to set up the situation. Mike Stanton: 4 for 6, 2 2B. That’s 42 hits on the season for him, 23 of which have gone for extra bases. We hoped you liked reading The Morning After: Game Recaps for May 25th by Joe Pawlikowski! What does it take to be a notable? C’mon!!! Recap FAIL for not mentioning utility infielder Valdez coming in to pitch and retiring Votto and Bruce. You can watch baseball for many years and not witness anything like last nights Reds/Phillies game. Two real gamers Valdez and Baez. Baez gave a performance full of guts,he hasn’t thrown 74 pitches since he was a kid,but he was the last line of defence and toughed it out. Valdez is a back up infielder who had never thrown a major league pitch before but retired Votto and Jay Bruce and has one more win than Ubaldo Jiminez. The value of guys like Baez and Valdez is impossible to quantify,but every team needs their like. It kind of renders this recap meaningless when they don’t even merit a mention. 1st player to start in the infield, come in to pitch, and win the game, since some guy named Ruth did it. And, as stated, Valdez gets the heart of the Reds offense out, on 10 pitches. No hits. One HBP (Scott Rolen… way to go Valdez!!!). And had a pitch clocked at 90 mph. PLUS, Valdez actually shook off Sardinia before he threw his first pitch!!! LOL., oh… and Sardinia was catching because Ruiz had shifted to 3b… because Polanco was playing second for Valdez. Ruiz, playing 3rd goes flying over the tarp trying to catch a foul in the top of the 19th. 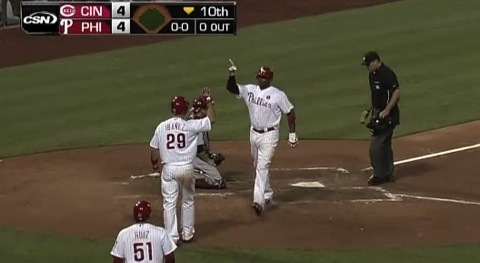 Danys Baez, roundly despised in Philly (and kinda deservedly), gets his name chanted during his 16th inning AB. And he earns it… throwing 73 pitches in 5 innings of scoreless relief. The recap left out a few tidbits. The value of Baez is 0, though he did pitch a nice stretch yesterday. Agreed its impossible to quantify value for the likes Valdez in that situation. He finds himself in rarified air, congrats to him. Still enjoy every inch of these recaps.